You would think that the most difficult dress to pick out for a wedding would be the actual wedding dress. If you ask a recently married bride, though, they might tell you that choosing bridesmaid dresses is an even harder task! While there’s nothing quite as important as the wedding dress you’ll wear, at least that process only requires keeping one body type, skin color, hair color, and personal taste in mind — your own! Because choosing the right bridesmaid dress (or outfit) requires consideration of all of your bridesmaids, it can seem like an impossible challenge. As you plan your wedding and make a final decision about your bridesmaid dresses, keep these tips in mind! Your bridesmaids are all going to look a little different, so you should give up the notion of finding the perfect color that will complement everyone’s unique aesthetic. Instead, stick with a constant: your wedding venue. If your wedding venue features all-white, ivory decor, just about any color you choose for bridesmaid dresses will be safe. However, if your wedding venue has a few key features, like satin curtains or purple wallpaper, you want to stick with colors that won’t clash. To avoid the issue of finding a flattering outfit for all sorts of bridesmaids, many brides give a general color palette instead of a specific item to order. 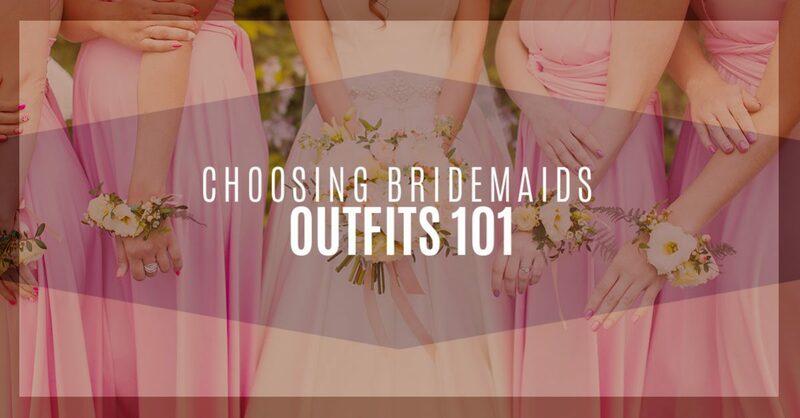 This way, bridesmaids can choose the dress that best fits their body type, or they can even wear something they already own. Plus, if you have a mix-gendered bridal party, a color is obviously a better option than a dress! If you’re worried about a particular bridesmaid not finding the right sort of ensemble, you can give more explicit instructions and point them in the right direction. Show them a few choices that might work and have them choose between those options. Make sure you don’t ask too much of your bridesmaids when it comes to cost. Chances are they’re already spending extra cash on the bachelorette party, travel, gifts, bridal showers, etc. This is another reason why giving a color and not a specific piece can be a great option — it allows people to keep their own budgets in mind without feeling any pressure to buy a dress they can’t afford. If you are set on a specific dress and know a bridesmaid won’t be able to afford it, consider offering to meet them halfway or at least contribute a certain amount to the dress. These tips might not be revolutionary, but they’re certainly important to keep in mind as you embark on the process of choosing bridesmaid outfits. These outfits will be in nearly every picture and will help to create the feel of the day, so they’re important! If you’re looking for a wedding venue in Katy, explore the beauty of Alegria Gardens today. Our wedding hall is elegant, classy, and designed for your perfect day. For more information, give us a call and check out our wedding packages online today!